by artist, lower right in ink: 1607 / Marti 25; by later hand, center verso in graphite: Marati(? ); by later hand, lower right on old mount in graphite: Hz. No. 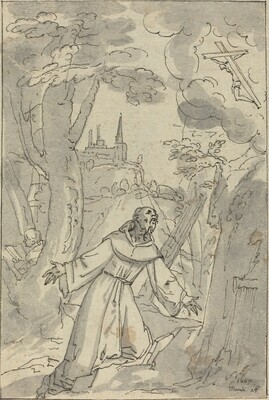 1518; by Rolf Biedermann, lower right on old mount in graphite: Joh. Sichelbein / vgl (not deciphered) Blatt (not deciphered) / B.
Oettingen-Wallerstein Collection, Maihingen; (C. G. Boerner Inc., New York); purchased 2000 by NGA.